January FAL 2014: First finish Qtr 1 - "Dot To Dot"
Bias quandry: Sizing vs Spray starch. What do you do to tame your bias edges? The Blame Game. Yep, Sandy "STILL" blames me for this DP group effort. I can't seem to shake that association. Sandy's breaking me down. I guess I will have to accept the all seem to think it began with me. But, one last time, "It wasn't me! I guess the quilt that will be so named is in my future. Celtic Solstice has been on the frame now for almost one week. I am having a mental block on my quilting decisions for Celtic Solstice. I talked about following the lines of the outer boarder. I am not sure what I want to do with the orange/blue border. What I am sure of, I think, is that the center will have an all over design. Boxy Stars progress, you can find the free pattern over at Bonnie Hunter's blog, Quiltville's Quips & Snips. This is one of my leader/ender projects. The blocks are coming along. No size in mind for the top. I guess I'll be done when I think its big enough. "It Wasn't Me" Quilt". Still in my head. I hope to begin sketching the design soon. Once I get something that resembles a quilt, I 'll share my progress. Graph paper and colored pencils here I come! This sketching thing will be a first for me. I am way out of my comfort zone. I mentioned Sue Daley's YouTube videos, if interested, you can find those on her website. She does beautiful hand work. Who knew hexies could look so good! If you would like to see what I am thinking about purchasing you can find the link here. Be sure to click on the image for the full affect. I am bent on learning how to quilt all types of feathers. Every YouTube video, DVD I watch or blog I read stress practict. I pratice drawing quilting designs on a piece of plexiglass I had purchased a while back. I have sketch books and drawing pads for practicing. Now, reading someones blog, not sure who's, I have now reverted back to playing with children's toys. For what ever reason, this has taken me to a carefree place. Just in case you didn't notice, there's a note for Sandy, of "Quilting for the Rest of Us". If you left me a comment on my most recent podcast, your odds of winning were good. I used the "Random Number Generator" to pick the winners! Drum roll please!!! Ladies, please email me your addies so I can get fabric in the mail. I will mail them out on Saturday. Thanks for commenting and participating in the giveaway. Let me preface by writing that SandyQuiltz over here can be the blame for starting this "whole" thing. It wasn't me and I am sticking to it!! The disappearing pinwheel was her baby. The video can be found here on YouTube. We will be working on this block over the MLKSI weekend. Sandy has also started a Flickr Group to share pics. 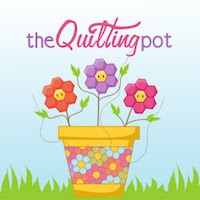 Go to her blog, QFTROUS, for the Disappearing Pinwheel group link. Below were the fabrics I was thinking about. I subsequently went with the layer cake. I will have more variety of colors. One more border to add. Here is the pic of the most recent purchase for border, backing and binding. I will more than like piece the back using the green border fabrice with the orange stripe fabric. 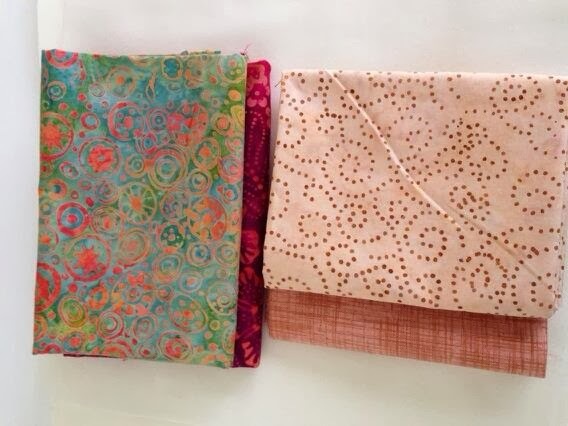 The lighter orange print is in the body of the quilt and will be used as the binding fabric. I am going to use 2.25" vs 2.5" strips for binding. I hope to get it loaded on "Lady G" this weekend! Tanesha, over at Crafty Garden Mom, most recent podcast discussed Art Journals. I tried my hand at art journalling. Teesha Moore has a YouTube Channel. She sparked my interest and her site can be found here. Although not complete, this was the extent of my efforts. My Va Beach trip will consist of hand work. I don't want to take the chane of having my featherweight having to be checked or worse, confiscated! So hexies and knitting will be my take along. At least in Va Beach it will be a little colder. Makes knitting feel more comfortable. Last but not least, I will be hosting a small giive away this weekend! Two lucky winners will receive two fat quarters each from my stash. All you have to do is make a comment on this post by MN on 20 January 2014. The random number generator will be used to pick winner. The two lucky people annouced on Tuesday. When I decide what, I'll update the blog with a pic and send out a Tweet. Whew, done at 2:23 p.m. NOW I can finally start sewing!!!!! UPDATE: Give Away fabric from my stash! Celtic Solstice: All blocks have been completed! I was soooo happy. Take a close look at the before picture below. Apologies for the photo quality. Take a REALLY close look. What do you see in the top right corner. Arrgghhh! I had another date with my favorite friend. Ms. Seam Ripper! Doesn't the below pic look a lot better! It may not be perfect piecing, however, the upper right corner is not all jacked up! Boxy Stars progress is coming along. I will be adding two more rows across. I am not sure of what the final size will be. I guess, as I go, I'll know when it's big enough. My Va Beach Weekend is coming up quickly. Approximately three weeks from now. It will be my first longarm adventure. If you are curious or interested, you can find it here: VA Beach weekend. I am actively taking inventory of my UFO's. There seems to be quite a few. I will be adding a UFO page to the blog. The page will consist of a list, date started and completed. Once the quilt has been completed. I will cross if off the list and add the photo the my 2014 finish page. 2014 Resolution is just two words: finish and organize. I have started that process. I try to have a fabric folding session each day. I am not always successful, but I am making progress, a snail's pace, but progress none the less. President's Day Sew In (#PDSI) - Military alphabet (Papa-Delta-Seirra-India) 20 January 2014. I should have said and this should read Martin Luther King Day Sew In. If you are off that day, join me in the fun. We may be able to squeeze in a "Google Hangout" if there is enough interest. So, on January 17, I will let you know if I am going to do a give away. So be sure to listen, read my blog or follow me on Twitter to find out. Thanks Torie for catching the Holiday sew in mix up!! If your plan is to finish a few UFO's this year, there is a 2014 UFO Along. There are going to be quarterly prize give aways. If you are interested, you can get the details here: 2014 Finish Along. Why not put your name in the hat for a chance to win some cool stuff, especially if you are going to be doing it anyway! Grant it, these quits have all been quilted but lack a label and binding! The are plenty more where these came from. I am starting with the quilts that are closest to being finished. Here is a bigger design wall! Not really, I purchased a flannel backed table cloth, separated them and hung it on another wall! Now, there just blocks on a wall. I have a little more piecing to do. 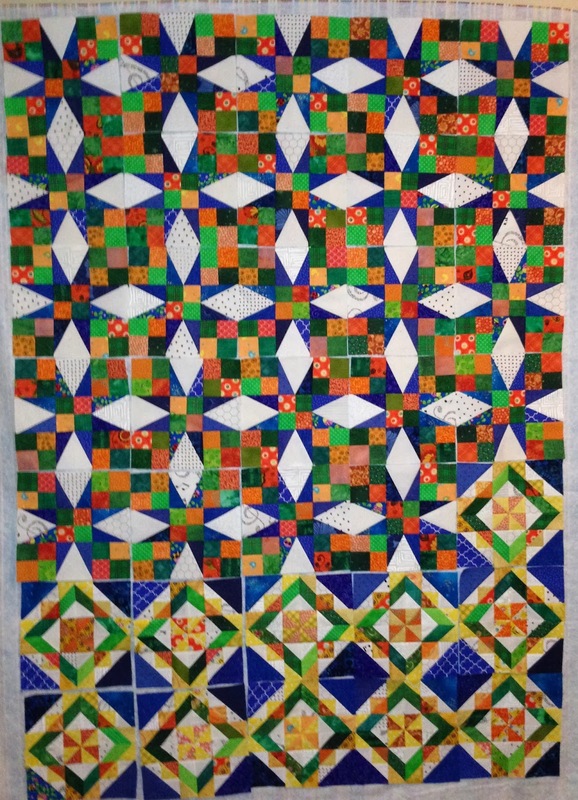 A few blocks positioned for easy piecing. A nearby basket with more pieces at the ready. Fifteen more blocks to go. I am happy to say this has been entirely pieced on my vintage Singer, Razzy! I have aversions to certain blocks, 50/40 flight block was one of them. I love the results this block gives. There is just one problem, the block has sooooo many pieces. 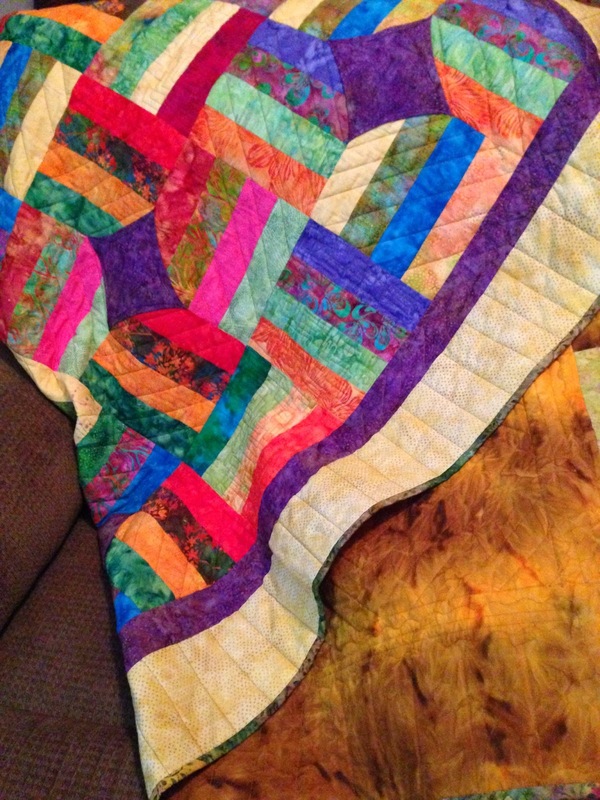 If it wasn't for this mystery quilt by Bonnie Hunter, I probably would have never attempted it. As you can see from the pic below, my excitement to get one of each block assembled was not quite what it should have been. Take a close look at the assembly of the bottom right block. You may say, I don't see a problem. There is a problem....those orange triangles should be white! Needless to say, I had another love affair with my seam ripper. My two words for 2014 are: Finish: WIP-knitting, quilt top and Organize: quilting, work, home life. At some point during the month of January I will make a list of what I need to focus on finishing. Now, just so you know, I may or may not share that list. A girl gotta have some secrets! I have recently started catching up on Podcasts that have not listened to over the last few month, late summer to be exact. 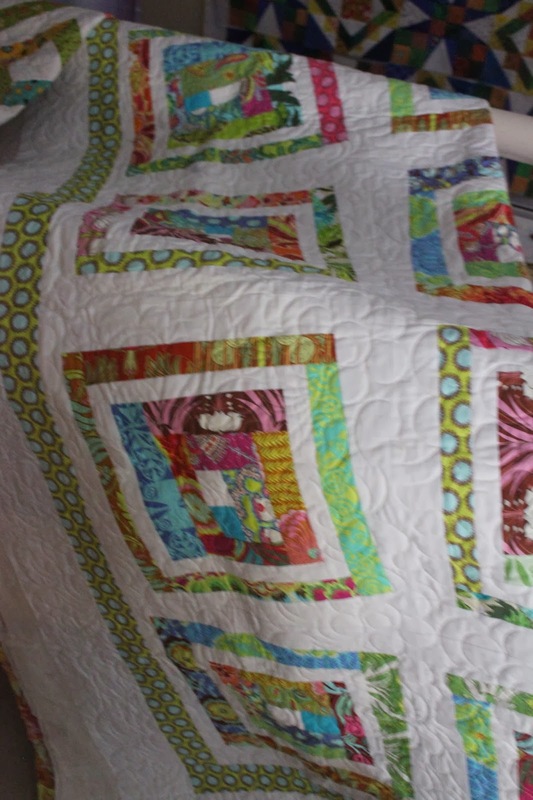 My most recent catch up was Nonnie's of Nonnie's Quilting Dreams. Here is Nonnie's Blog. While playing catchup, I discovered a *New Podcast, new to me anyway: Blessed2Quilt. I do follow here on Twitter. Her podcast made me laugh out loud. It's how she phrases some of her comments! BTW, she hasn't blogged or had a recent podcast upload, however, very worthwhile to read and listen to what she has published! Baby it's cold outside. Yes, even here in GA. With cold weather come warm crafts...knitting. I am currently knitting this project for my youngest. The pattern link: Hooded Tweed Cowl I wish I was a fast knitter. She would have this to wear during the snowy forcast for the DC area. I am sending well wishes to all those affected by the cold, snowy weather. I can sypathize with you. I have lived through the pain. I can say, if I am ever in a weather related power outage I will still be able to sew. Between my hand crank and treadle vintage Singer, quilting would continue. 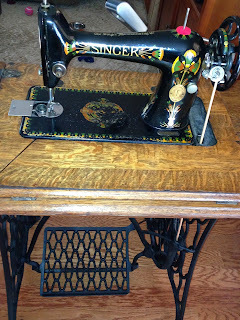 A pic of my treadle. #NYSI, there was lots of Tweeting was going on! Need I say more? By the evening, I had succumbed to 2 glasses of "wine".